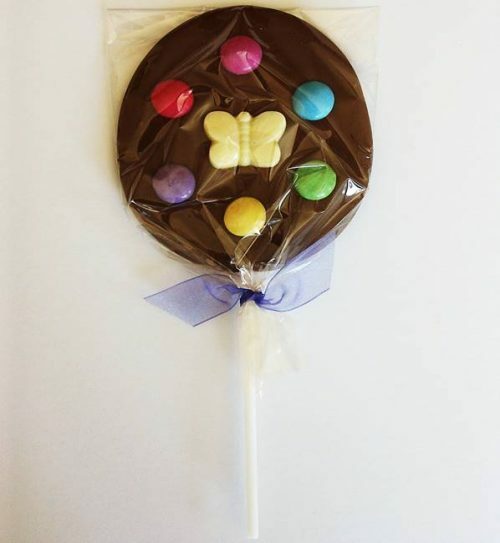 This rich and creamy handmade milk chocolate lollipop is decorated with Smarties and a white chocolate butterfly. Please note that the colour of Smarties may vary. Milk chocolate (sugar, cocoa butter, whole milk powder, cocoa mass, emulsifier: soya lecithin, natural vanilla flavouring), Smarties (sugar, cocoa butter, skimmed milk powder, cocoa mass, butterfat (from milk), wheat flour, lactose and proteins from whey (from milk), rice starch, emulsifier (sunflower lecithin), fruit and vegetable concentrates (safflower, radish, black carrot, lemon, hibiscus), orange oil, spirulina concentrate, glazing agents (carnauba wax, beeswax white), natural vanilla flavouring), white chocolate (sugar, cocoa butter, whole milk powder, emulsifier: soya lecithin, natural vanilla flavouring).